It’s Friday night in Downtown Pittsburgh, and Bricolage artistic director/founder Jeffrey Carpenter is directing a rehearsal of the company’s upcoming production of The Wonderful Wizard of Oz. 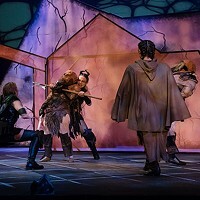 The cast and crew are trying to figure out how to create the sound of the Tin Woodsman’s body being torn in two using scrappy, unconventional tools; after several experiments, Carpenter and assistant director Connor McCanlus think they finally have it figured out. Don’t remember that gruesome scene in the film? The script for this production was adapted by CP contributing writer Lissa Brennan, largely based on the original book by L. Frank Baum and not the movie, which includes no mention of how the Tin Man originated. Back at rehearsal, one actor holds a large piece of fabric with both hands, ready to rip; another has placed a torn piece of cardboard under the blade of a paper cutter. 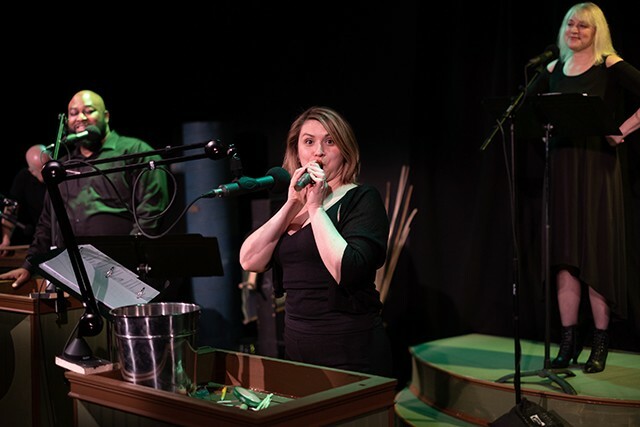 Stage manager Katy Click gives the actors the clue to begin, and the sound of the Tin Woodsman’s body being ripped to shreds echoes throughout the small theater. The room gasps in a collective groan of disgust. 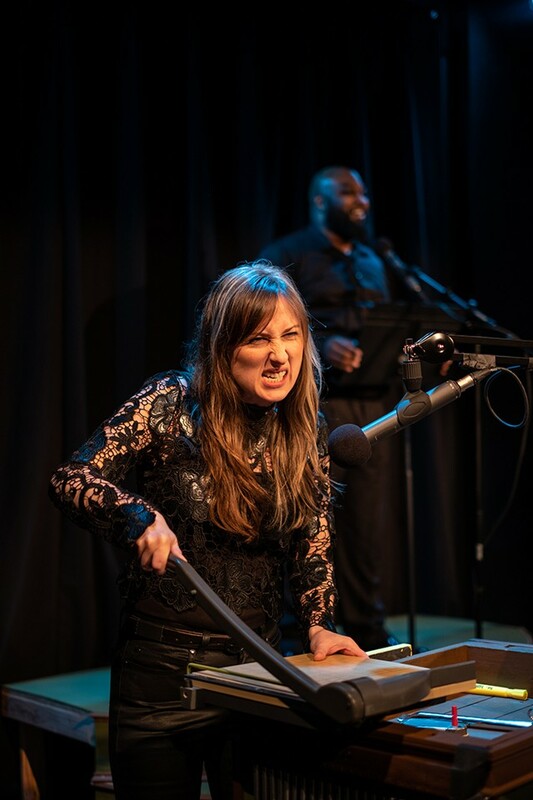 Like other Midnight Radio performances, backed only by musical director Deana Muro on keyboard and with occasional mic effects from sound engineer Brendan Kepple, the actors are responsible for almost all of the sound effects throughout the play. Each performer plays multiple roles, sometimes switching from a character like the Tin Woodsman to Toto the dog in one breath. 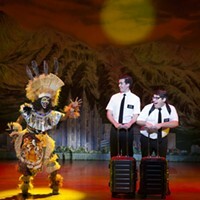 It’s an impressive feat of acting and choreography, as the actors share Foley tools and almost dance across the stage, trading places and sharing mics throughout the performance. Oz’s cast includes Midnight Radio alums Jason McCune as the Tin Woodsman and Lisa Ann Goldsmith as the Witches. McCune, the goofiest of the cast, makes jokes between takes. Goldsmith is more serious, carefully making sure all of her sound effects are timed in sync with others. When it’s time for crows to attack the scarecrow, both McCune and Goldsmith beat their chests rapidly. Perfection. Bricolage’s stage design is minimal. 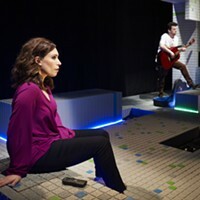 In most Midnight Radio performances, the scenery and characters’ appearances are largely left to the audience’s imaginations. A yellow brick road does wind its way on the floor from the seats to the back of the stage, but when it’s time to act out a scene of the characters moving towards Oz? “Somehow, we have to be skipping.” Carpenter looks to Goldsmith, who takes inventory at her podium. She picks up a shoe and some straw, then bangs them on a bed of stones in front of her. It works. Close your eyes and it actually sounds like the characters are on the go. Newcomer Sam Lothard, most recently seen as Dukem in Pittsburgh Playwrights’ solemn period play Savior Samuel, pulls a 180 for this role, raising his voice to a squeal, while wearing a tiny yellow cat-eared headband to play the oversized Cowardly Lion. Rounding out the cast is Nancy McNulty, whose slow drawl as the dimwitted Scarecrow is a total joy to watch. If rehearsal is any indication, expect laughs from both the audience and the actors on stage throughout the show. With such a fun cast and script, who wouldn’t want to join this crew on their adventure to the emerald city? Only someone, perhaps, without a brain.